They took classes in basements, had a hotel for a residence, and spent a lot of their time trying to explain to people what Rehabilitation Therapy was. There weren’t many of them back in 1967 – fewer than thirty, all of them young women – the first-ever intake into Queen’s School of Rehabilitation Therapy. Nearly fifty years later, they remain close friends and colleagues and are committed to giving back to their school and their university, both as individuals and as a group. “And try explaining what occupational therapy is,” says Shrout. “So we kind of had to stick together,” says Watson. “We had to have a certain amount of money to establish the fund,” adds Ambler. (In 2005, the amount was $10,000; today it’s $50,000.) “But the money didn’t have to be upfront, we could pledge it over five years.” Today the fund totals more than $29,000 and, since its establishment, the bursary has given out more than $6,000 to 10 students in the second year of the occupational and physical therapy programs on the basis of financial need. In addition to their support for the bursary, all three women have plans to remember Queen’s – either through an amount designated in their will (Ambler and Shrout) or by gifting an insurance policy to Queen’s and designating the school as the ultimate beneficiary (Watson). 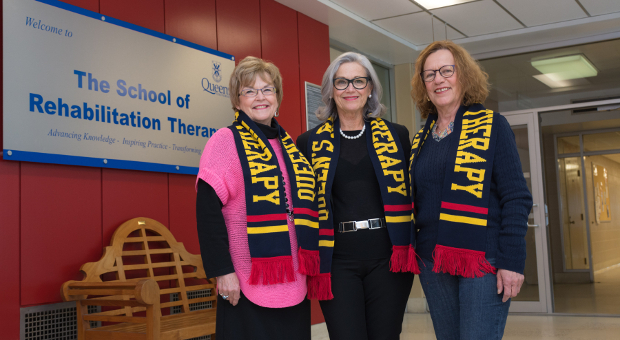 And making a difference – to Queen’s and the wider community – has been important to the first alumni of the School of Rehabilitation Therapy. Today, as the women look forward to joining the School’s 50th Anniversary celebrations in 2017, their friendship, passion and commitment to each other, their professions and their school will inspire others to give back to Queen’s.